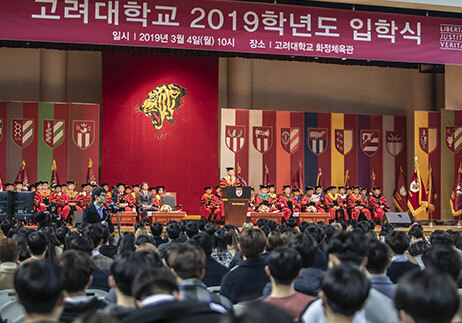 Korea University held its 112th commencement ceremony in the Tiger Dome at 10 a.m. on Monday, February 25, 2019. A total of 6,182 students—4,161 undergraduate and 2,021 graduate students—received their degrees at the ceremony. 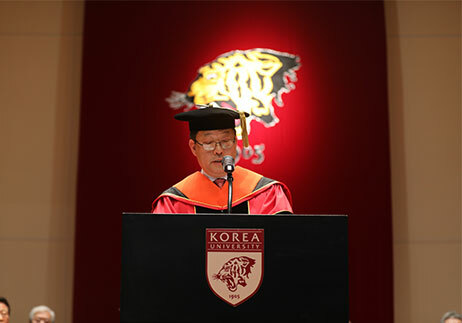 The Chairman of the Korea University Foundation Jae Ho Kim said in his congratulatory remarks that “You’ve learned what you need to become the leaders of Korea and the world. To become a true global leader, you should dream big. You need to be hungry to put your heart and soul into achieving your dream. Your dream will come true if you have the will to make it happen.” He added, “The world is waiting for your brave challenges. Think differently, be the first one to explore uncharted waters, and aim higher. You may face unexpected challenges along the way. 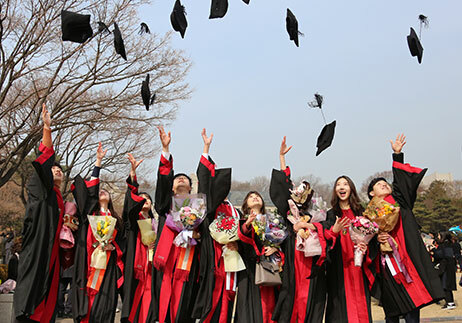 But you can overcome these challenges and make a brighter future if you remind yourself of the never-give-in spirit of Korea University. 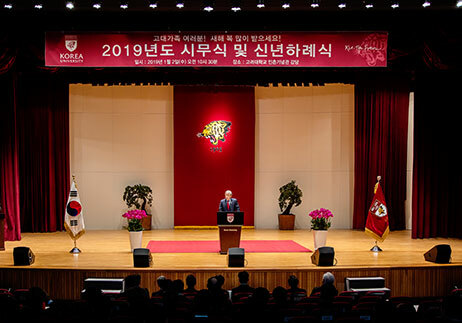 The Chief Vice-chairman of the KU Alumni Association In Kim remarked, “You’ll go into the world where the fourth industrial revolution is taking place. You’re excellent talents who are qualified to become the global leaders of this new world. You can achieve your dream.” He advised the graduates to continue to move toward their dreams regardless of circumstances, while showing their steadfast loyalty to their alma mater and serving the communities to which they belong. The founder and CEO of L&P Cosmetics, Oh-sub Kwon, also delivered his congratulations to the graduates. He began by saying he was honored to speak at the commencement ceremony of his alma mater. “I went into the cosmetic business in 1996 after 12 years in academia. I failed big time twice before establishing my company 10 years ago thanks to the success of Mediheal, a face mask brand. You need to fail well if you want to succeed well. From now on, you’ll fail more times than you succeed. But never give up and fight for your dreams with a defiant and creative attitude,” he remarked. He also said that, “While writing this speech, I thought it would be a good idea to share a song of my life.” He went on to talk about ‘My Dream’, a song by Chi-hwan Ahn. He remarked, “What is your dream? Think of your long-cherished dream. Think of what you did to achieve the dream. You have a whole world ahead of you, a world with full of challenges and uncertainties. But remember, you’re never alone,” emphasizing that their 330,000 fellow alumni would be with them all the way and advised them once again not to give up on their dreams. That day, he donated KRW 100 million to a scholarship for the rugby team of Korea University, adding to the KRW 1 billion he had donated to the university for the development of sports last September. 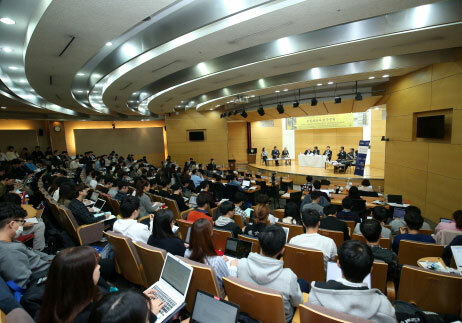 In accordance with his wishes, Korea University is actively supporting athletes on campus. Kwon has demonstrated consistent interest in supporting KU students since 2011, contributing academic scholarships, education funds for purchasing research aids, scholarships for international students, and College of Natural Science building construction project fund, which total at around 14.4 billion won. Since 2017, he has donated 30,000 sheets of Mediheal, the famous face mask from L&P Cosmetics, to KU students at the annual Korea-Yonsei Games.